When did you decide you wanted to work in the whisky industry? It was not a career path which ever “appeared” on my radar whilst in my school years. Like all young lads I dreamt of being a professional sportsman, specifically a footballer, but I became a professional cricketer playing for Derbyshire County Cricket Club. Escaping the cold English winter of 1982, and whilst playing in the warm South African summer, my life started to change. I eventually settled in South Africa in October 1984. I was working for a company called Stellenbosch Farmers Winery (SFW) and in 1985 at a social gathering met a delegation of directors and senior managers from Morrison Bowmore Distillers (MBD). I was invited to go and work with them, and whilst in Scotland in the mid to late 1980s with MBD, I got to meet and work alongside some of Scotland’s legendary characters in the whisky industry. People like Brian Morrison, Alistair Ross, David Gressick and the still very active legend Jim McEwan. It was the passion which these distillers shared that made me realise that I certainly would like to be part of the whisky industry. On my return to South Africa from Scotland, my mission was to try and show that although the Scots are known worldwide for their incredible whiskies, it is not their sole prerogative to make it. Tell us about how you got to where you are today with The James Sedgwick Distillery and Distell Group. 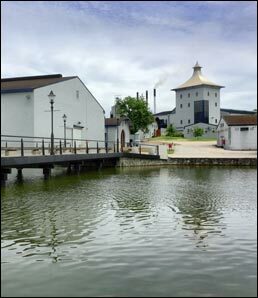 On returning from Scotland in 1989, SFW moved me to the James Sedgwick Distillery (JSD) in Wellington where I worked for 2 years planning, with our Technical Services Department, the movement of our small whisky operations at the Robertson & Buxton Distillery (R&B) from its home in Stellenbosch across to Wellington. At that stage, the JSD was predominantly a brandy distillery. I was appointed manager in August 1991 (only the 6th manager in the now almost 130 year distillery history) and was entrusted with the transition of improving both the quality and the scale on which we made South African whisky. SFW and Distillers Corporation merged together in 2000 to form the new company Distell and I was asked to continue my role at the distillery. What does your role as master distiller entail? something 'special' and 'limited'. Last year’s Three Ships 10 Year Old Single Malt Single Cask PX Finish was the first. Only 800 bottles were made available which sold out within 48 hours. Tell us a bit about what you get up to outside of whisky and distilling? When I am not involved in my work then you will probably find me on my mountain bike cycling the foothills of the beautiful Limietberg Mountain range which is the back drop to our beautiful town. I also still play a little “old man’s” social cricket and we are a team of professional gents who try each second year to tour a different continent and play against like-minded people. Living less than a pitching wedge from the Wellington Golf Course, I do enjoy golf but unfortunately this is the one game I do not play enough, maybe one day! My family is important and my South African wife of almost 30 years, Tania and our 23 year old twins, Raymond and Rozaan, also keep me busy. Rozaan is getting married in 2 weeks time and that is now the most time consuming activity, that of “wedding planner”. Raymond coaches cricket in South Africa during the summer and during the winter months travels to the UK where he coaches at the prestigious Harrow School, just outside of London during the English summer. Tell us about the brands you produce and their global success? When I started as manager of the JSD we only had the one whisky which was selling commercially and that was the Three Ships Select. 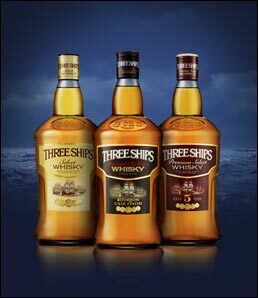 The Three Ships range of whiskies now includes a 5 year old blend, which was named the World’s Best Blended Whisky at the 2012 World Whiskies Awards, a Bourbon Cask Finish blend and the Three Ships 10 Year Old Single Malt which in 2015 won the Worldwide Best Whisky Trophy at the International Wine & Spirits Competition (IWSC). We also launched South Africa’s first single grain whisky in 2009 called Bain’s Cape Mountain Whisky, named after Andrew Geddes Bain a pioneering pass builder in the mid 1800s here in South Africa and whose most famous pass 'Bainskloof' rises out of our town of Wellington and over the Limietberg Mountains. The pass was completed in 1853 and was the first road to connect the Cape with the inland of the country. The whisky has, since its launch, taken six consecutive gold medals at the IWSC (2010-15) and was named the World’s Best Grain Whisky at the 2013 World Whiskies Awards. It is a whisky which is very close to my heart as the time period from conception to birth was 10 years and we feel that we achieved what we set out to do… create a single grain whisky which appeals to the unique South African demographic as well as the growing worldwide whisky audience. In what regions, countries, markets are your products available and who distributes them? Over 90% of our whisky is consumed within South Africa and our main focus is to satisfy the market locally. Therefore at the moment we have a few online options in Europe and a relatively small presence in Canada. The USA is the first market where we have taken Bain’s Cape Mountain Whisky with the focus on growing the brand where it was launched in the Mid-West in July 2015 and in New York in October 2015 with our distribution partner Terlato. We are also available at a number of Duty Free stores (managed by Big Five Duty Free) and a few online stores in the UK. You were recently named Master Distiller / Master Blender of the year in Whisky Magazine’s Icons of Whisky Rest of World Awards 2016 – what do you think makes you stand out from the others who made the shortlist? To be perfectly honest, the Icons Award was a total shock to me. When the email announcement from Rupert Wheeler at Whisky Magazine arrived in my inbox and the phone started ringing, the rest of that day was a blur. Looking back now I am humbled and also excited that the work which not only myself but our whole South African team has put into our whiskies has been recognised. If I have to look at the “what and why” then it could be that I have been part of a team that has taken a country, known more for its world class brandy and wine, and we have put it firmly on the World Whisky map. What plans do you have for the future of your company? 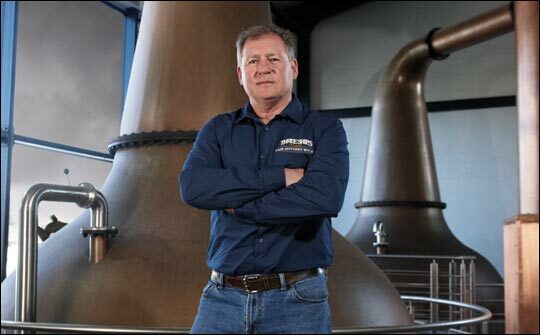 I recently had a discussion with our new managing director, Richard Rushton and my promise was that although I am in the twilight of my career I honestly believe that our whiskies are only in the dawn of theirs. I am fully committed to helping to continue the development of our whiskies and everything about South African and world whisky in whatever capacity our company sees fit. Even after 32 years in the industry and 25 years as manager of the JSD it is amazing and exciting times which we are now in. I do not think I have ever been as excited about what I do as I am now! As a distiller, how much do you engage with and educate the consumer about what you do and what importance do you place on this? This is a role which has become more and more of what I now do. I have an incredible team at the distillery and a potential successor, as the next distillery manager, in Jeff Green which allows me to spend more time engaging with the public and consumers. It is a role I enjoy and one I hope to spend more time involved in. I see the education of “What is whisky?” as being vital in the growth of the whisky category both in South Africa and the world. I always say that there is not one whisky for every occasion and that if you are only drinking one whisky then you are doing yourself a disservice. The promotion of the responsible journey through the world of whisky can only be good for us all. What can we look forward to from The James Sedgwick Distillery in 2016? We are constantly working towards the future and have some whiskies being laid to rest this year that will bring enjoyment to the whisky-lovers out there in a few years' time. We’re especially looking forward to launching the 2005 vintage of our Three Ships 10 Year Old Single Malt later this year as well as a very special whisky to be launched as the second limited release whisky under the 'The Masters Collection'.